I headed to Lennox Head, NSW on the weekend. Lennox is only 2 hours south of Brisbane and 1 hour from the Gold Coast. Lennox Head is surrounded by some of the most beautiful national parks and rainforests you will ever see if you ever want to explore this coastal region further. We booked into the North Coast Holiday Park. The park staff was both friendly and helpful. There is a choice of cabins, tent or caravan sites. The park is immaculate and has all the basic tourist park necessities i.e. BBQ’s, camp kitchen, dump point. It does lack a playground and swimming pool though and sadly, it is not pet friendly. My favourite thing about this park is how perfectly situated it is to everything. It is only a short walk to the main street of Lennox Head. Ideal if you fancy brunch in one of the busy coffee shops. The surf club is directly across the road. I’m also told the bowls club is a great feed if you need a night away from the kitchen. All within easy walking distance. 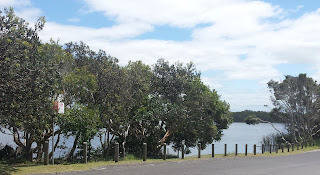 I didn’t see a lot of children in the park but maybe they were all at Lake Ainsworth Recreation Area, which is a tea-tree stained dunal lake right beside the holiday park. This lovely, well grassed recreation area has barbecues, picnic tables and a couple of blocks of toilets very close by. It is perfect for swimming, stand-up paddle boarding, kayaking or canoeing. Ideal for children as there are lots of shallow areas and no motorised water sport is allowed in this protected lagoon. To the front of the holiday park is Seven Mile Beach which is a renowned surf beach. It was super busy on the beach with all the little surfers having a club day and many bigger surfers enjoying some waves. A lovely weekend was had by all and both this holiday park and region come with glowing recommendations from me. Definitely one of my favourite spots as it is just that little bit away from the hustle and bustle of Byron Bay and the Gold Coast.